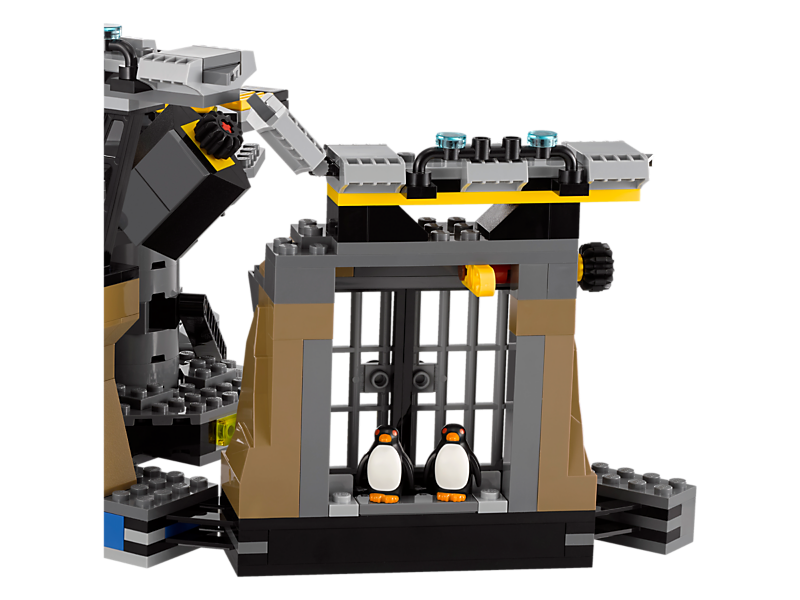 Defend against The Penguin’s Duckmobile invasion of the Batcave in THE LEGO® BATMAN MOVIE: Batcave Break-in set. 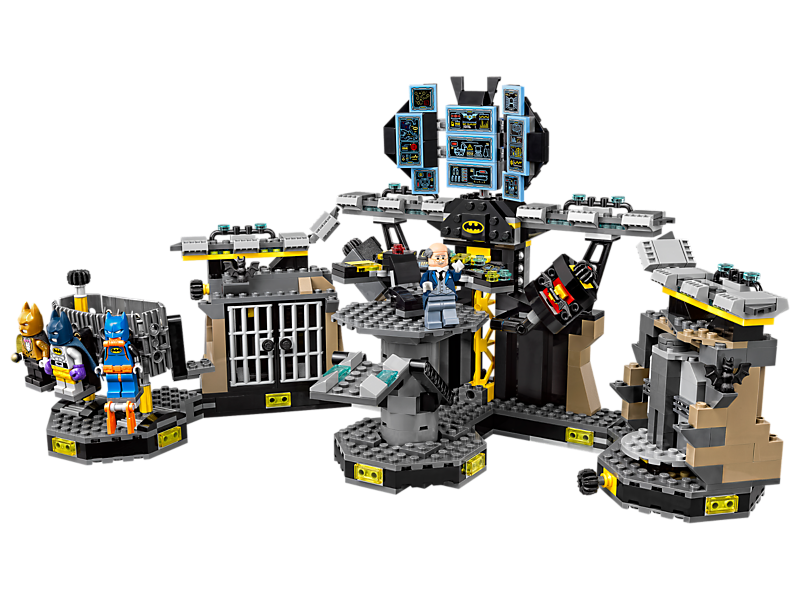 The highly detailed Batcave features a rotating transformation chamber for Bruce Wayne™ to ‘transform’ into Batman™, rotating Batcomputer control center with multiscreen elements and elevating platform function, and a prison with an exploding escape wall function. 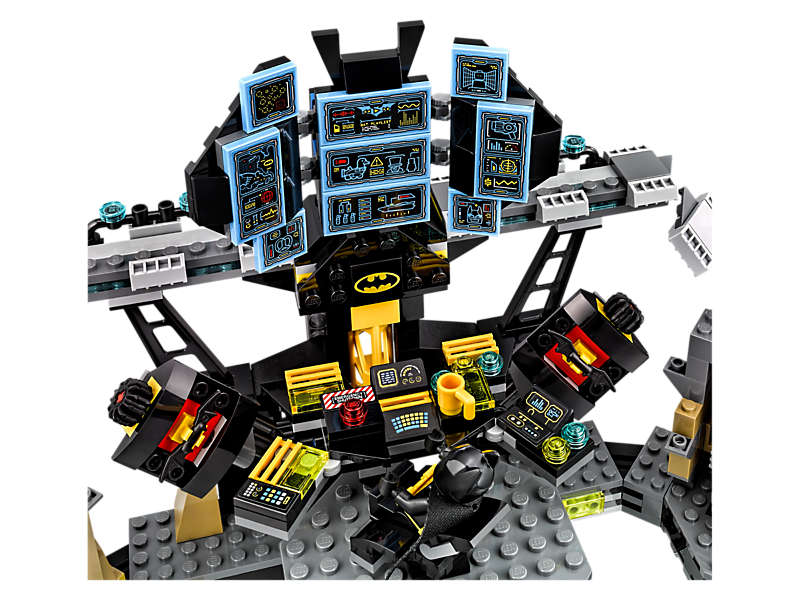 The Batcave also has a rotating wardrobe with alternative Scu-Batsuit, Raging Batsuit or the Bat-Pack Batsuit minifigure bodies for Batman. 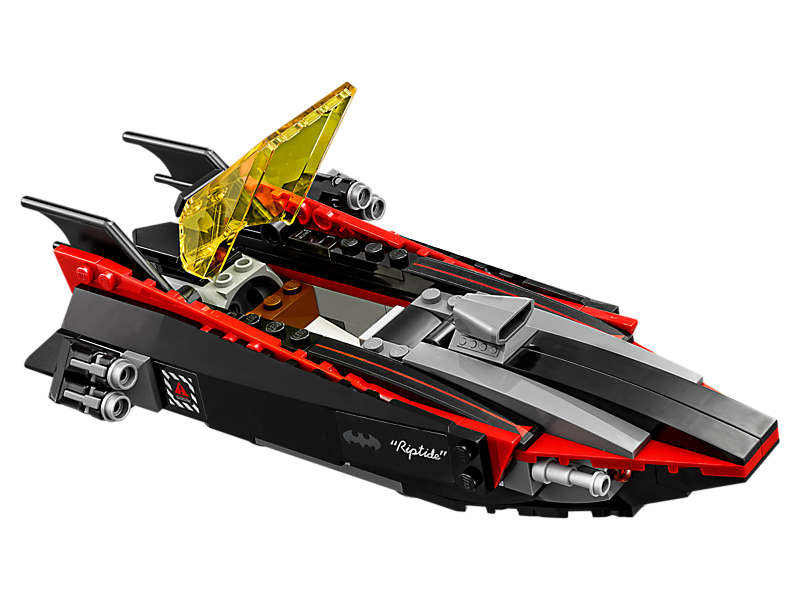 Dial up the conflict by using the Batboat’s spring-loaded missiles against the Duckmobile’s dual stud shooters and flick missiles. 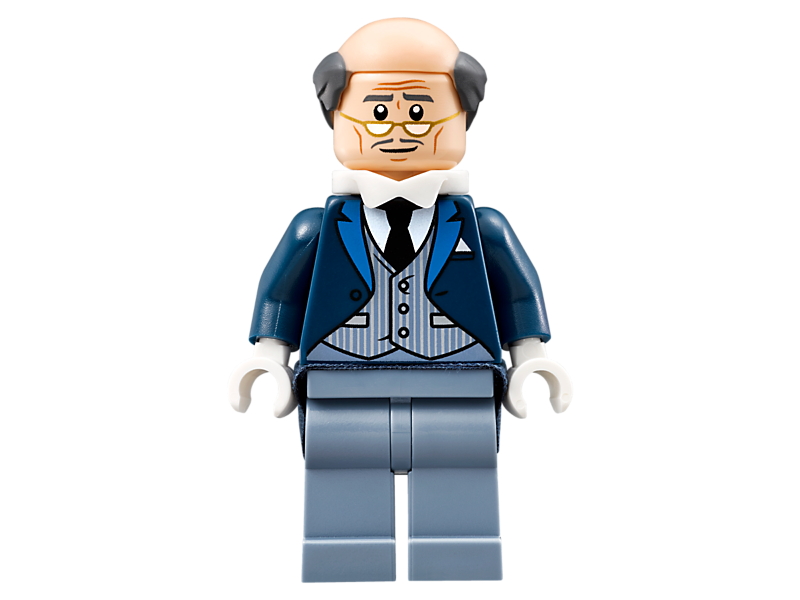 Includes four minifigures plus two Hench-Penguin figures. 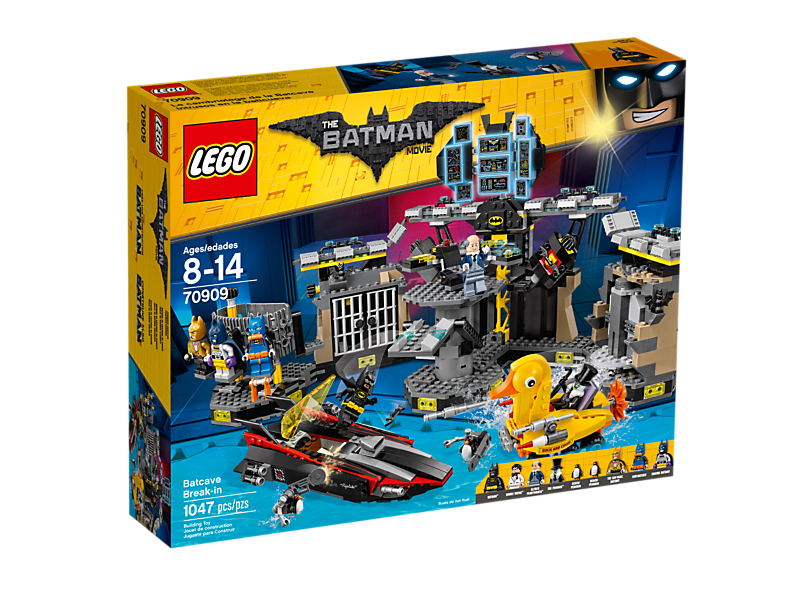 Includes four minifigures: Batman™, The Penguin™, Bruce Wayne™ and Alfred Pennyworth™, plus two Hench-Penguin figures, each with robot-style hands. 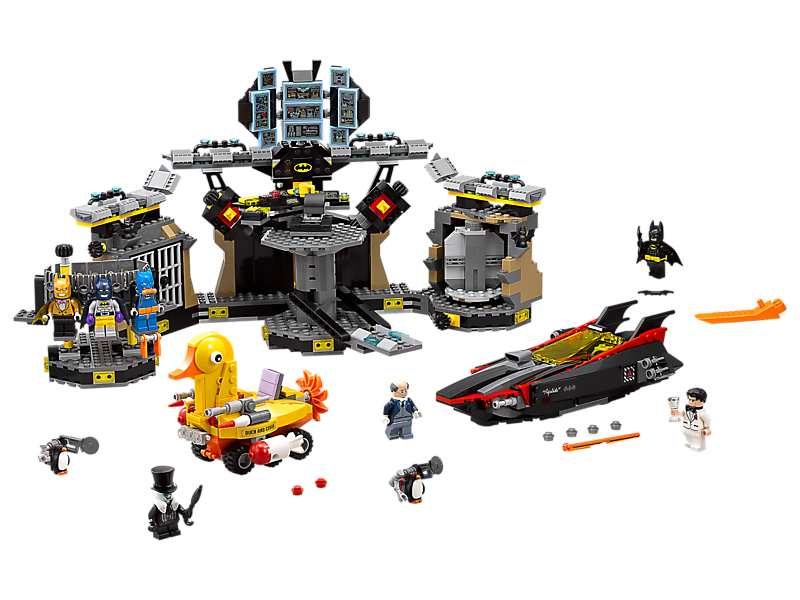 This action-packed set features a highly detailed Batcave, Batboat and The Penguin’s Duckmobile. 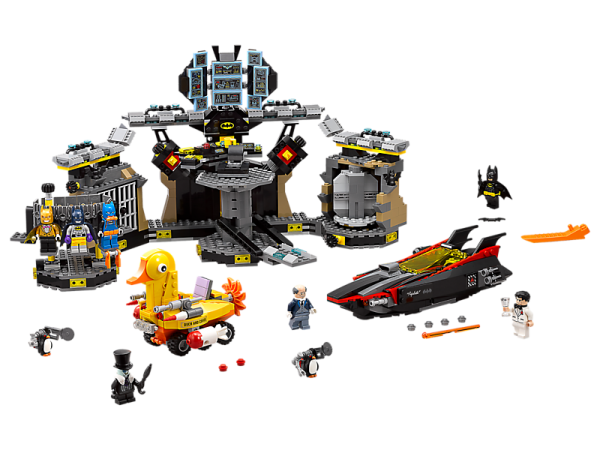 The Batcave features a rotating transformation chamber, raised and rotating control center with bat-shaped Batcomputer with multiscreen elements, rotating chair, elevating platform function, two cabinets to hide Batman’s Batarangs, plus Batman™ logo tile, prison with exploding escape wall function and a rotating wardrobe with three different Batsuits (minifigure bodies) for Batman. 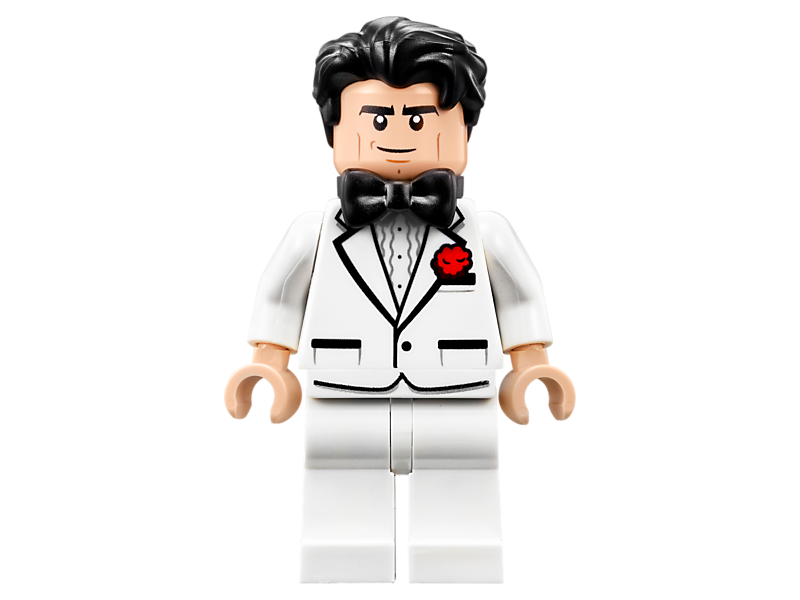 Put the Bruce Wayne™ minifigure in one side of the transformation chamber and rotate to reveal the hidden Batman™ minifigure. 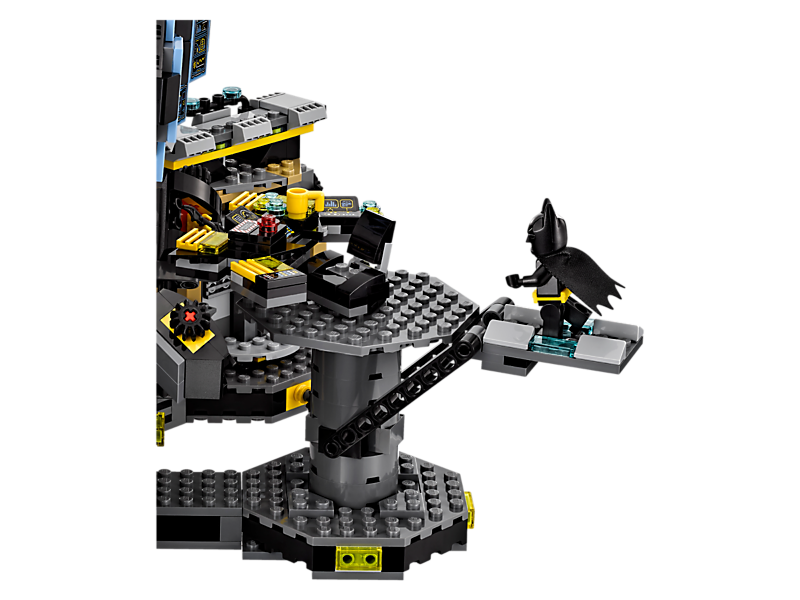 Activate the elevating platform to move a minifigure from the ground to the Batcomputer control center. 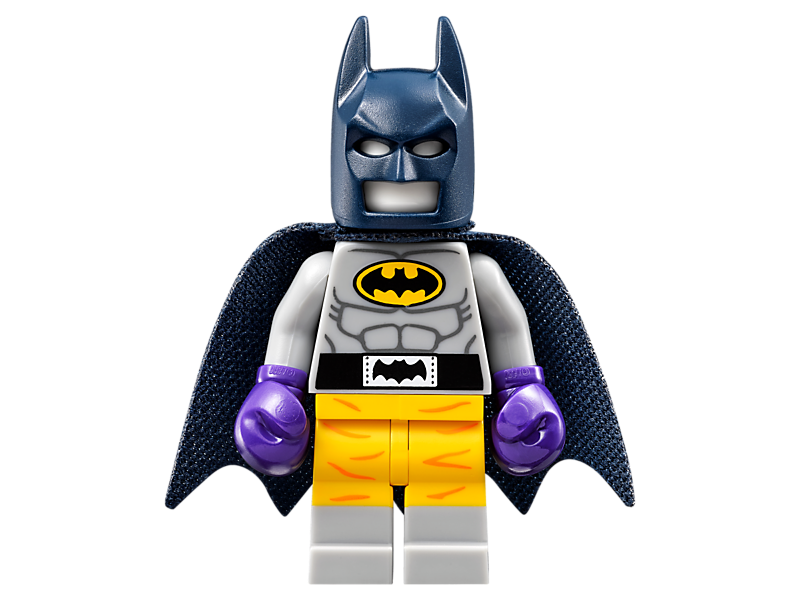 Select Scu-Batsuit, Raging Batsuit or the Bat-Pack Batsuit minifigure bodies for Batman™ from the rotating wardrobe. 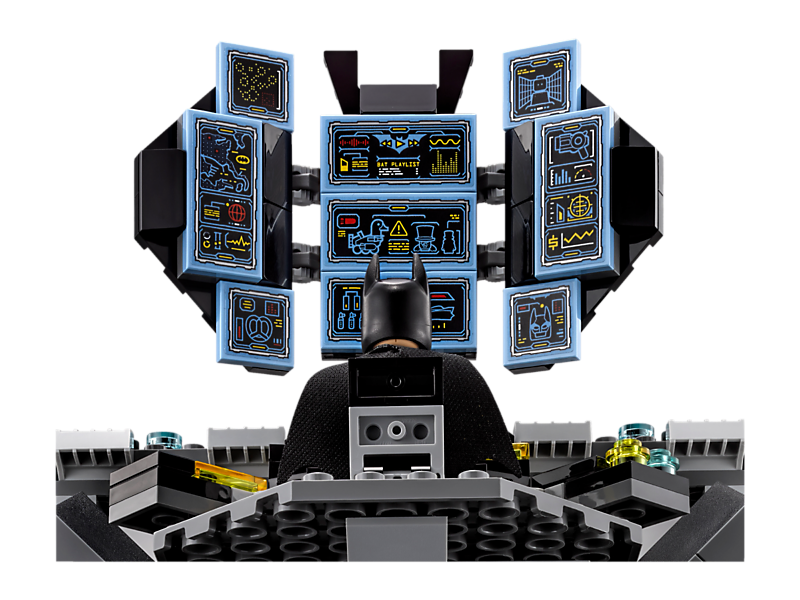 The Batboat has a minifigure cockpit, two spring-loaded missiles with secret trigger, four stud shooters and rear batwings. 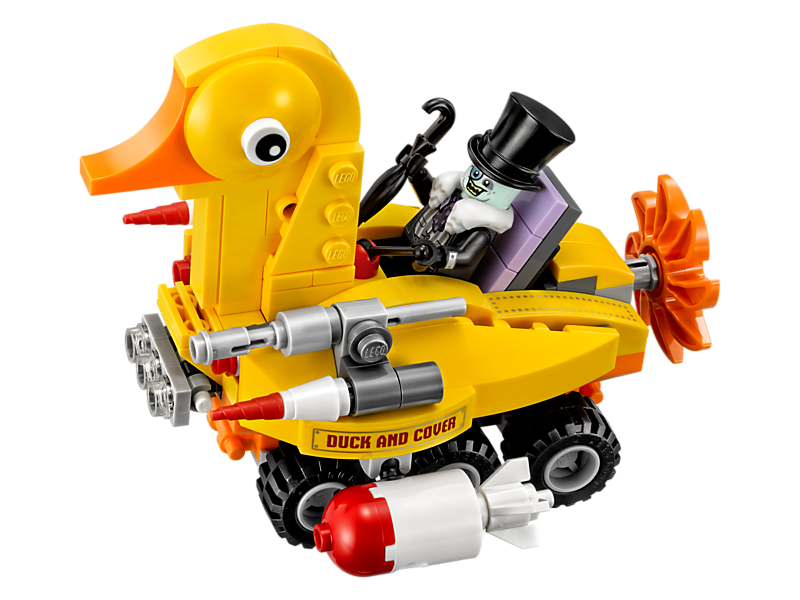 The Penguin’s Duckmobile features a minifigure cockpit with adjustable lever, two dual stud shooters, 2 flick missiles and a rotating propeller. 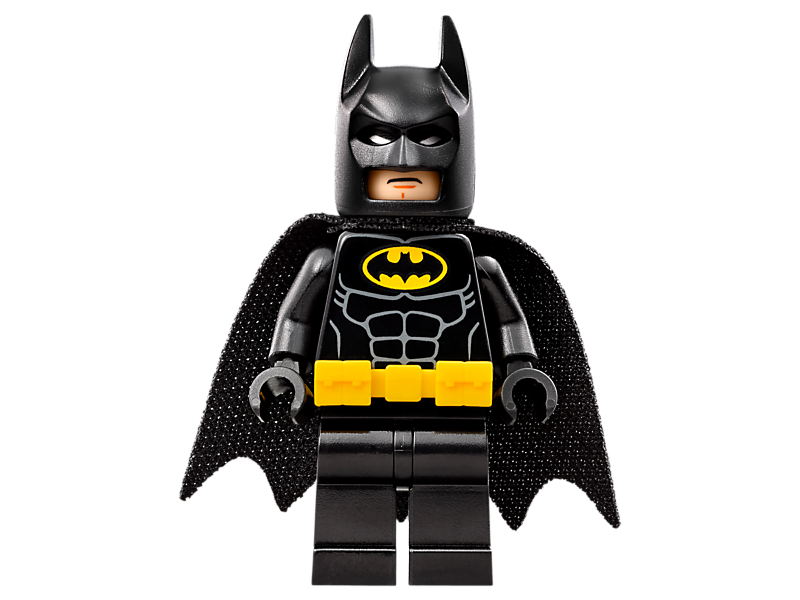 Weapons include Batman’s two Batarangs and the Hench-Penguins’ buzzsaws. 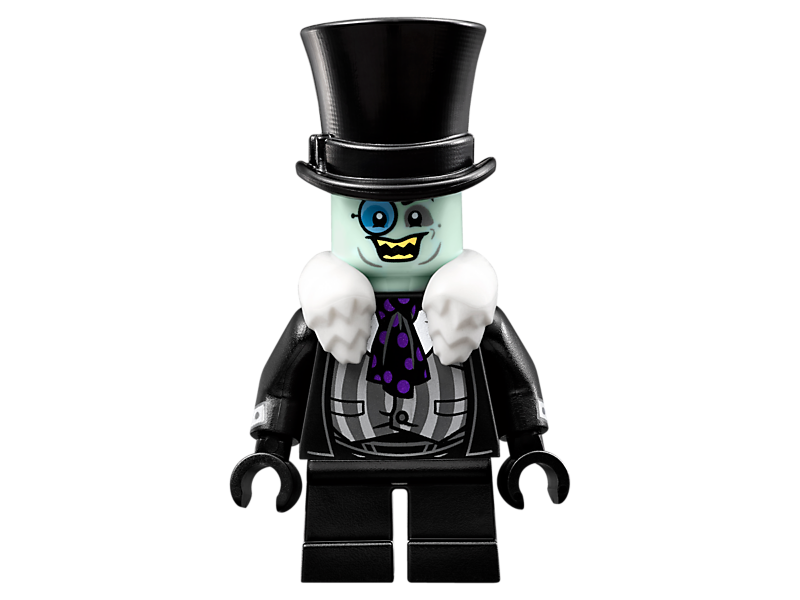 Accessory elements include Batman’s cape and new-for-spring-2017 molded utility belt, breathing device, flippers, microphone and gold-colored cowl, The Penguin’s fur-style collar, umbrella and top hat, and Bruce Wayne’s glass. 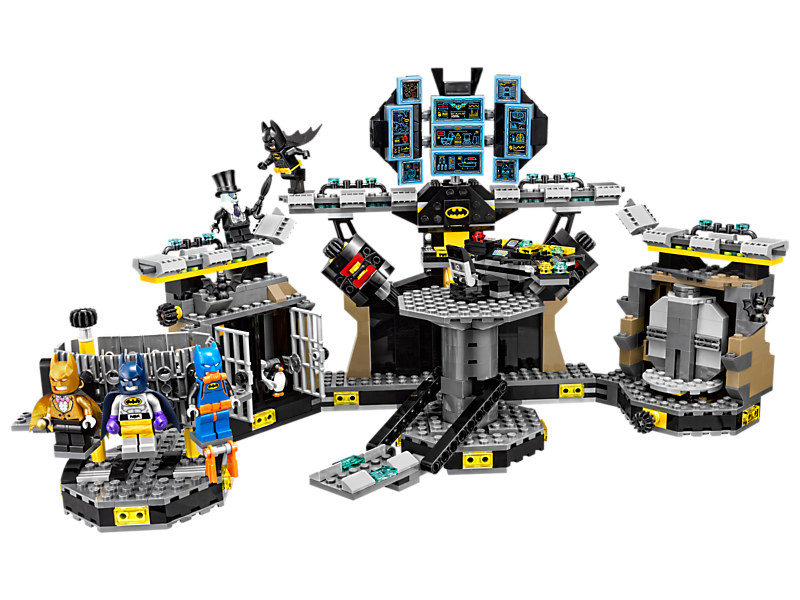 Batcave measures over 8” (21cm) high, 15” (40 cm) wide and 7” (20cm) deep. Batboat measures over 2” (6cm) high, 7” (20cm) long and 4” (12cm) wide. 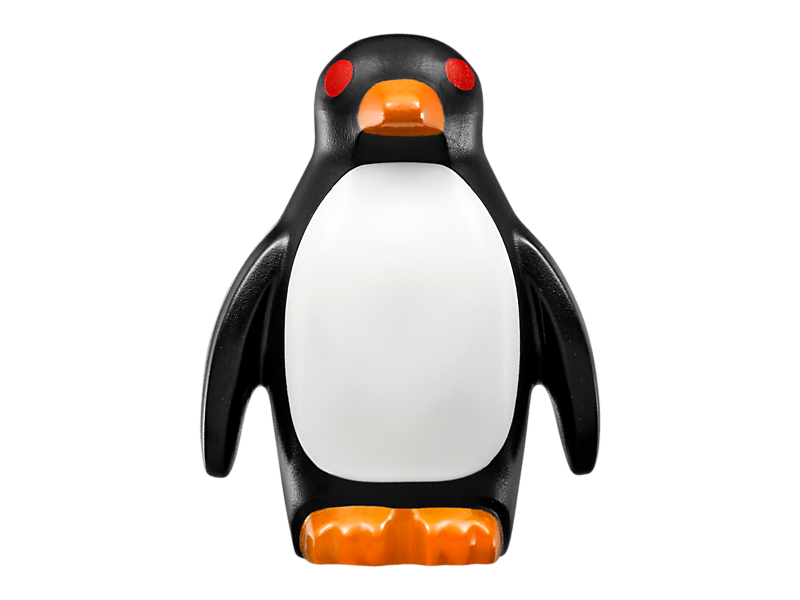 Duckmobile measures over 3” (9cm) high, 4” (12cm) long and 3” (10cm) wide.